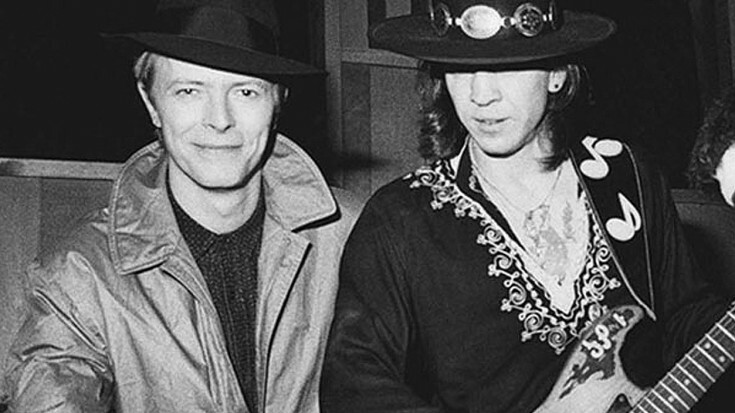 In January 1983, David Bowie invited Stevie Ray Vaughan (after spotting Vaughan and Double Trouble performing at Montreux Jazz Festival in July of the previous year) to record guitar for six new tracks he’d written for up-coming release, Let’s Dance. With the album a success, Bowie was keen for SRV to join his group for the subsequent Serious Moonlight Tour. However, with Vaughan reluctant to leave Double Trouble, (who had just finished recording their debut, Texas Flood) Bowie’s management offered to let the group open the show on select tour dates as a compromise. But just four days before the tour began, Bowie’s management reneged, telling Vaughan’s manager, Chesley Millikin, that the band would not be included and, furthermore, Vaughan was not to talk about the group or its new record in interviews. With the offer pulled, Vaughan’s manager took him off the tour, leaving Bowie to rely on his longtime guitarist Earl Slick to fill in. Although both artists still achieved huge amounts of critical and commercial success during their respective careers, what they may have gone on to do together remains one of Rock n’ roll’s great “What Ifs”. No video footage of Bowie and Vaughan performing together is known to exist, however, several taped rehearsal performances do, including these excellent versions (in the clips below) of “Let’s Dance”, “Cat People (Putting Out the Fire)” and “China Girl”, recorded at the Las Colinas Soundstage in Dallas, TX on April 26, 1983.